Islamic State militants have claimed responsibility for the deadly museum attack on Wednesday in Tunisia that claimed over 20 lives, according to an online audio recording cited by Reuters. 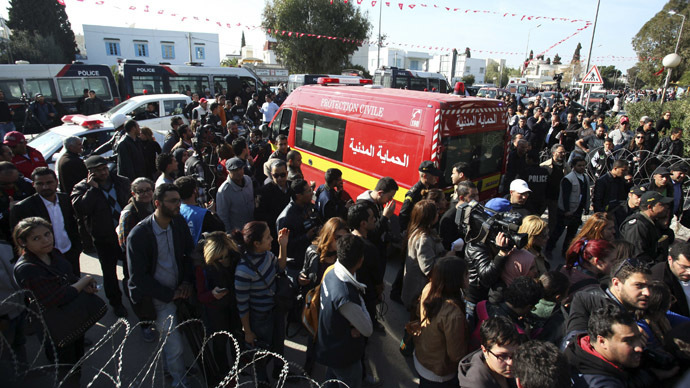 The three-hour attack took place at the Bardo Museum in Tunisia’s capital on Wednesday. As a result 23 people died, including 18 foreign tourists, five Tunisians and two gunmen, Health Minister Said Aidi said on Thursday. Fifty more were injured. Among the foreigners killed were one British national, three Japanese, two Colombians, two Spaniards, an Australian, a Pole and a French citizen, according to the Tunisian PM Habib Essid's statement. The Russian Foreign Ministry confirmed to TASS that one Russian citizen was killed, while another was wounded and subsequently hospitalized. Bloomberg reported on Thursday that four Italians and a Russian national were among the victims of the attack. The agency cited information provided by the Costa Cruises company. The recording distributed online praised the two gunmen calling them "knights of the Islamic State." Security forces arrested nine people connected to the attack, according to a statement issued by the president’s office on Thursday. Five of the arrested were directly connected, while four others were from a supporting terrorist cell, it added. The PM said one of the terrorists was already known to Tunisia’s intelligence services. Essid identified two attackers as Yassine Labidi and Saber Khachnaou in an interview with French radio station RTL. Labidi was "known to the security services, he was flagged and monitored," Essid said. The attackers had massive bombs strapped to their bodies, Tunisian President Zine el Abidine Ben Ali told the French TF-1 TV channel on Thursday. On Wednesday, demonstrations were held in Tunis against terrorism, as people gathered on the capital’s main street, Avenue Habib Bourguiba, waving national flags and singing songs from the 2011 Arab spring revolution. A silent demonstration was planned for Thursday outside the Bardo museum. The latest attack is the deadliest involving foreigners since the 2002 suicide bombing on a synagogue on the Tunisian island of Djerba, where twenty-one people died, including 14 Germans, two French tourists and five Tunisians. Islamic State militants have gained a foothold in war-torn Libya, Tunisia’s neighboring state. Formerly known as ISIS or ISIL, the jihadists currently control territories in Iraq and Syria and operate in other unstable regions of the Middle East, North Africa and Asia, including the Sinai Peninsula. Local media reported the two militants, who were gunned down by security forces in the museum attack on Wednesday, visited Iraq and Libya. However, this information has not been confirmed by officials. On Thursday, the Tunisian president’s office issued a statement saying army forces will be sent to large cities to reinforce security.